I just noticed today that a new version of FAlbum was released on 6th May 2006. There has also been an upgrade of LightboxJs, taking it up to version 2.0.2. I was in two minds as to whether or not to update my mashup but decided that as I want to upgrade my website I may as well release a new version of the mashup. Whilst I am still providing a download of both the diff files and the complete FAlbum plugin, I have made a change the mashup. Rather than including the LightboxJS scripts in the mashup I instead rely on the user have the WP LightboxJS script installed in their wordpress system. So that users that already have the plugin installed don’t have to have two copies of LightboxJS in their blog. Users will be upgrade to future versions of the WP LightboxJS plugin without needing to upgrade their FAlbum plugin. I have also decided to not include the WP LightboxJS plugin within my downloads so I do not wish to tie users to a particular version of the WP LightboxJS plugin, after all it’s easy enough to download and install it. I am also hoping that I will be able to release a style for FAlbum that does the same as this mashup but without changing any of the core file of FAlbum… watch this space. The installation instruction are included within README.Mashup.txt which is in the download files. You can download the 0.6.5 version files from my download page. I seem not to be able to get it working in my site, which is strange, since the wp-lightbox plugin is up and running on my site in the posts; works fine. And I see no difference in the way the script is being called in your plugin and in the way I call the script in my posts. Someone got a clue what the problem is here? sorry, let me describe the problem! That makes solving it easier, hehe! When I install your plugin (deactivate falbum, remove, upload your version and activate again, etc.) 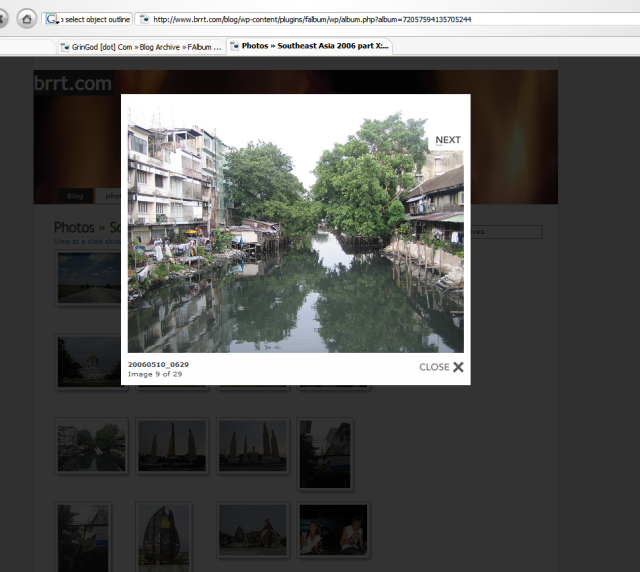 and then go to the photos page and click on a thumbnail, only the picture loads, in a blank screen. The rel=”lightbox” stuff seems so be ignored. But in my posts I use lightbox as well, and I call the script in the same way, but over there it does work! Hope someone can help me… thanks! It appears to me that it is working just fine. I’m not sure if you got something fixed yourself but it is important to note that LightboxJS doesn’t start working until everything on the page is loaded. If you click the images before the browser is finished then yes the images will just open in another (blank) page. It’s definately working. I even put a screenshot online so you can see it. I’ve had it working in Firefox 1.5.0.3 and IE 7 Beta 2 on Windows XP. Wow, great, thanks a lot. Guess the problem is with me (somewhere, hehe). Thanks for the effort; it looks great! Okay, gringod, I localized a bit of the problem: when I am logged out, so being a guest, the plug-in works right away, no problems! When I am logged in, though, the plug-in doesn’t work. So apparently my ‘being logged in’ makes the plug-in not work, and only(!) when someone is an admin. As per the terms of the Creative Commons license I should point out that the LightboxJS 2 plugin is the work of Safirul Alredha. It could be that something in your css is interfering with the lighbox css. Check you don’t have a css class that is setting the width to 100% the has the same name as a lightbox css class. oh yes, you’re right! i changed my wordpress theme with the default one and i have no problem, now i have to find what exactly in my .css does this. Thanks a lot! LightboxJS doesn’t start working until everything on the page is loaded. If you click the images before the browser is finished then yes the images will just open in another (blank) page. Wondering if you gave any more thought to the ‘pass through’ to the default view provided by falbum. If this lighbox feature could be implemented like it is on Zooomr I think it would be even better. Clicking on the thumbnail would take me to the default page that falbum typical returns, but clicking on a small icon that would appear when you hover the thumbnail would take me to the lighbox version. Thats an interesting idea. I need to bring my version up to the latest FAlbum release (0.6.6) so I’ll have a look at that at the same time. Any one else got any more ideas I’d be pleased to here them. GrinGod [dot] Com » Blog Archive » FAlbum Mashup - A game of two halves.